Samvera Connect is an annual gathering of partners working on the Samvera repository platform. This annual meeting brings together developers, metadata librarians, project managers, and others for four days of presentations, workshops, and discussions on the future of the project. More information can be found on the Samvera site. Hyrax is the next evolution of the repository platform built on a framework of Fedora and Ruby on Rails. Michael Giarlo, Steve Van Tutyl, and Julie Rudder take the podium to look at the focus for future releases including an emphasis on accessibility, usability, and better collection management. For those institutions unable to commit to managing a standalone repository with developers, librarians, and support staff DPLA, Stanford University, and Duraspace created Hydra in a Box. This service allows organizations to run a repository in the cloud. Michael Giarlo and Hannah Frost take a retrospective look at the project, how it met its goals, and future steps for followup grants. Michael Tribone, Tracy McMath, and Kate Lynch present an overview of the current state of accessibility in Samvera as well as ways to make sure that institutions consider it as they customize the interfaces for their own branding and workflows. Key takeways include leveraging sensible defaults and use of ARIA. 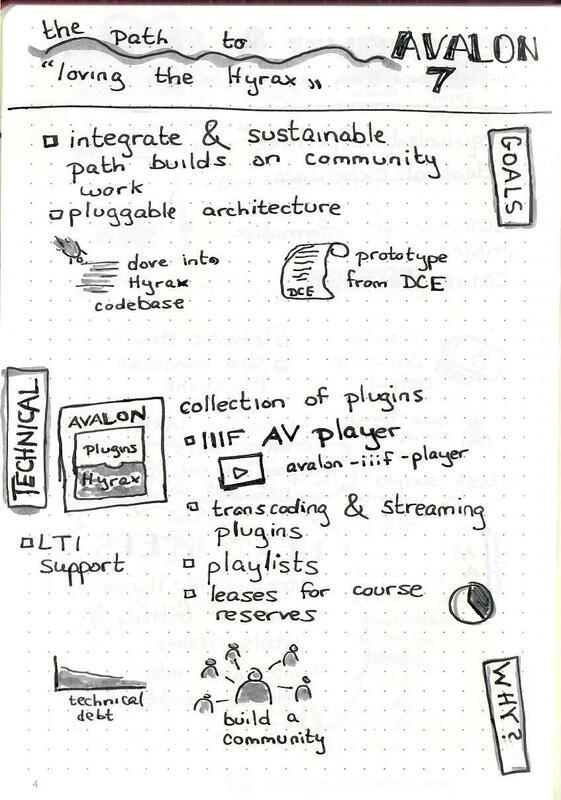 The Avalon platform is built on top of Hyrax as a way to manage large scale audio and video. Recently the underlying code was migrated from a old version of the framework to Hyrax. Additional features have been added in the process including IIIF support for videos and limited accessibility for course reserve materials. Because the Hyrax platform is enable to leverage the power of linked data it is helpful that conceptual models share comon terms. Rather than having each institution roll their own data moels what can be done to facilitate the easier exchange of content while making it possible to more quickly bootstrap a repository? 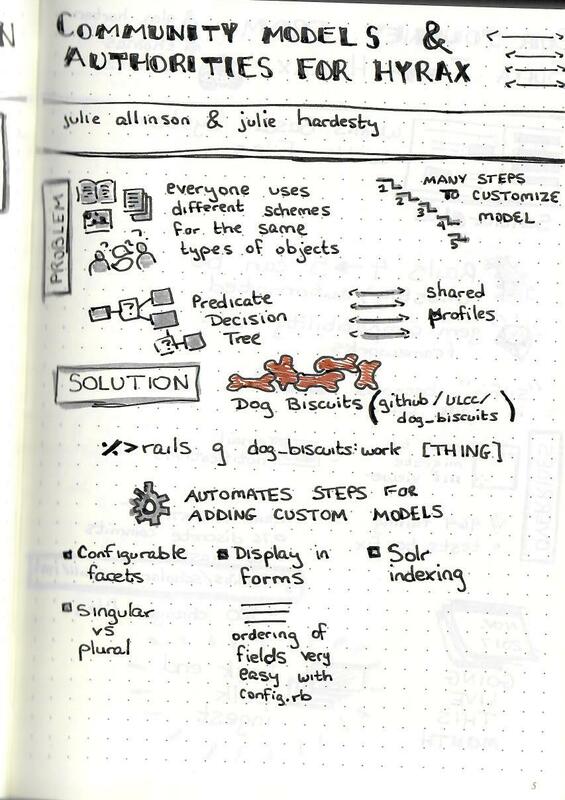 Julie Allinson and Julie Hardesty present the Dog Biscuits tool as a way to quickly configure all aspects of the system from data models to form interfaces to facets without requiring lots of developer time. The University of Cincinnati underwent a migration from the legacy Sufia 7 to the new Hyrax platform recently. Glen Horton and Thomas Scherz share many of the lessons learned along with tips for other organizations looking to upgrade large scale archival repositories. Hyrax is not a turn key solution for organizations looking to build a repository solution. 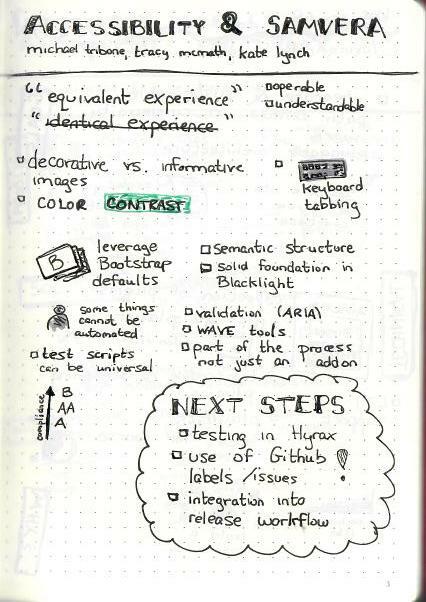 Chris Diaz, Adam Erling, and Nabeela Jaffer walk through their universities have developed a process for using sensible defaults and SASS styles to make management and customization more streamlined. For institutions running DSpace installations the migration to Hyrax is laden with many obstacles. In this panel Steve Van Tuyl and Josh Gum explain strategies for moving to a new repository system. Among the topics covered are how to handle a temporary freeze in ingests, normalization of names and titles over time, and coping with bad data.